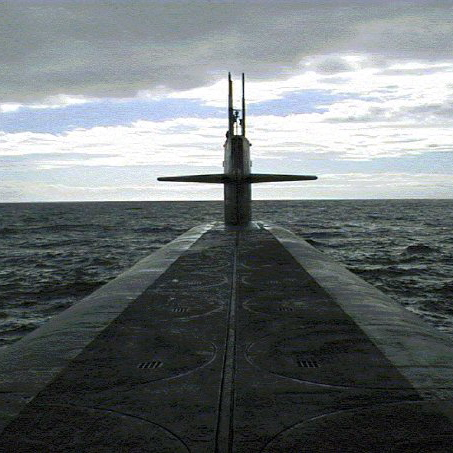 Living in Kellie's World: A Visit to the USS OHIO. A few minutes later, a visibly shaken and nervous Larry King climbed to bridge accompanied by his wife. He didn’t say much and was in hurry to go below, which was unfortunate because dolphins frequently like to the surf the ship's bow wave. dolphins surfing a submarine bow wave. I wouldn't have the opportunity to speak with Larry again until lunch. 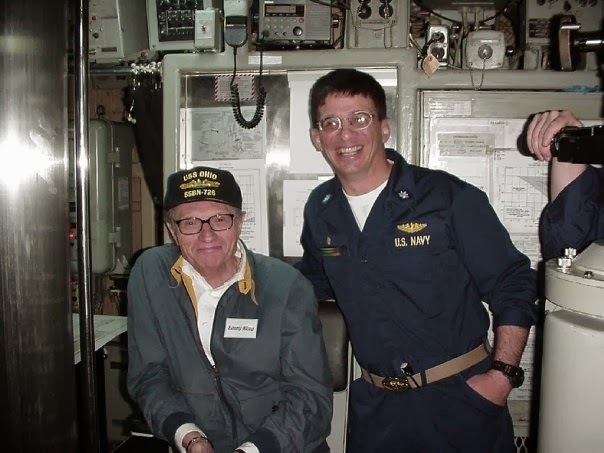 I would be busy getting the ship out to sea and submerged, but we had a series of tours and activities planned to acquaint Larry and his friends with life aboard a nuclear powered submarine. By the time we sat down in the wardroom for lunch, Larry was completely at ease, and he was not the least bit shy about discussing his initial apprehension or how his wife and friends all conspired to get him aboard. 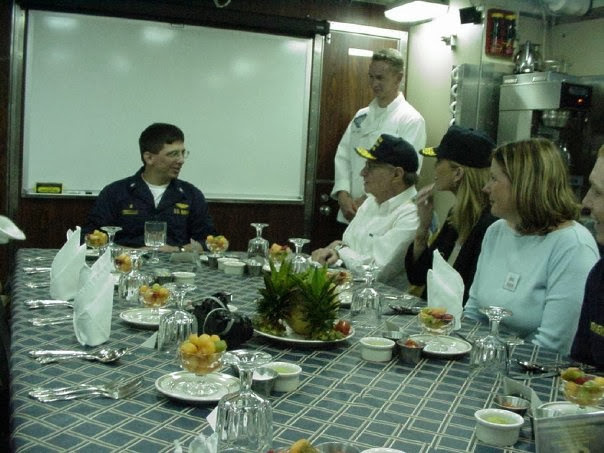 We presented Larry and his wife with hats that they proudly wore to lunch, a huge breech of wardroom etiquette, but we let is pass to avoid embarrassing anyone. Of course, everyone else wanted hat, but they would have to purchase theirs. We opened the ship's store, which, on a submarine, is little more than a locker with ball caps, coffee mugs, and other trinkets bearing the ship's name and logo. I don't remember the name of the first gentleman in line, he owned a hotel on the Las Vegas strip, but he dropped a $100 bill for a $12 dollar hat. When the young sailor handling the transaction explained that he couldn't make change, the hotel mogul said, "Then just give me $100 worth of stuff." The other guests were equally as generous. They emptied our store, increasing the crew's morale and recreation fund by $2200. After lunch, we entertained our guests, and ourselves, by making high speed turns and doing angles and dangles, a series of maneuvers where we rapidly change depth by taking steep angles to move through the water column. The day passed quickly and we surfaced to head back into port to drop off our guests. Larry sat on the conn so that he could watch and listen to the ship control party as they maneuvered the USS OHIO back towards San Diego. A more relaxed Larry King after an enjoyable day at sea. This was my first extended encounter with anyone of celebrity of status. I'm not sure what I expected, but I assumed that Larry and his friends would be a bit snobbish. I could not have been more wrong. Everyone was incredibly polite, friendly, and genuine. In the weeks following the visit, Larry wrote two glowing articles about the ship in USA Today. A few months ago, I tried to contact Larry so that I could share the above picture and maybe get him to sign a copy, but I got no response to my tweets or email. I'm sure my messages were lost in the deluge of solicitations that celebrities receive. Maybe this post will find its way to him? Nice. That video of the dolphins surfing the bow wave was incredible. What a sight. Out of curiosity, would extreme undersea maneuvers give the same effect as an aerial or ground maneuver? Does it catch your stomach like a roller coaster would or is it a unique feeling entirely? I think the claustrophobia factor might get to me a bit, but this sounds like a fun experience. Submarine speeds don't compare so you don't get the same effect. Anything not lashed down will go flying and everyone has to lean just to stand up straight. I'm going to add this link to the post. What a cool encounter! I hope you do get an autographed picture! I have said it before, but I never get tired of these stories. I find them fascinating. Sub life sounds like it could be a lot of fun. I imagine some things are routine, but still. I'll promote this post, let's see if Larry finds it. 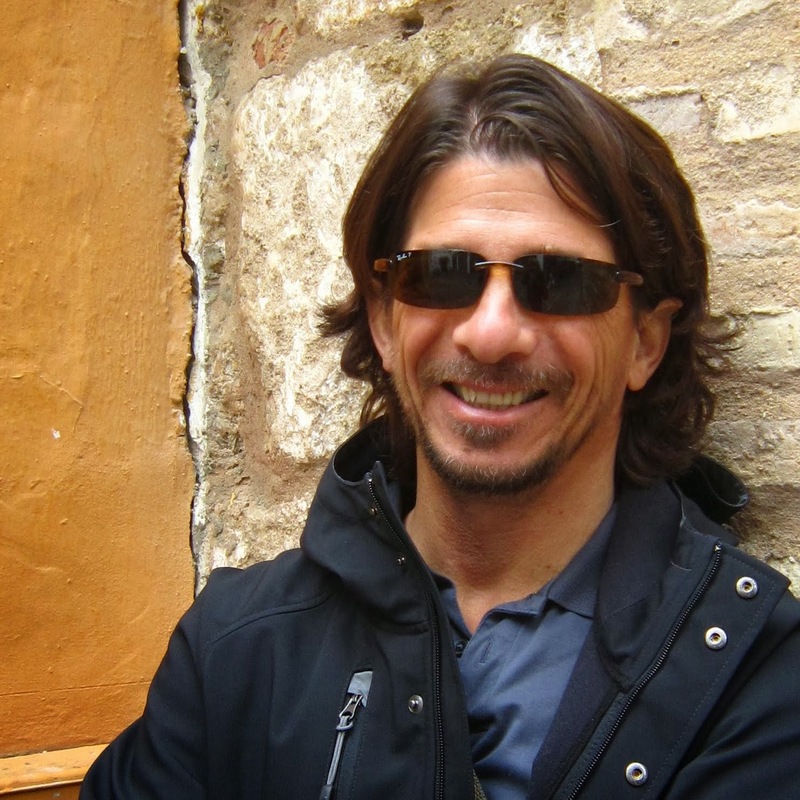 Another great story for us landlubbers! I haven't had many experiences with celebrities, but back when he was running for president I ran down Jerry Brown with my car. I love reading about your sub stories since it's so incredibly far removed from anything I ever did. And I'm glad to hear that Larry was a cool dude. I hope he sees this post and signs your photo! This is so cool! 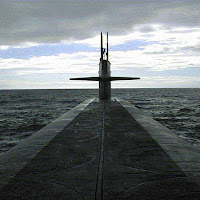 I live in San Diego and never think of the subs, just the big ships we always see! We are row mates at Yeahwrite, really enjoying your blog.